Trigger Warning: Some of the stories and information shared may trigger unexpected emotional reactions or responses, therefore please read with caution. If you do experience a strong reaction - connect with someone you trust who can help you process your reaction. I was three in this picture. I remember this Halloween well. I was going to be a witch. 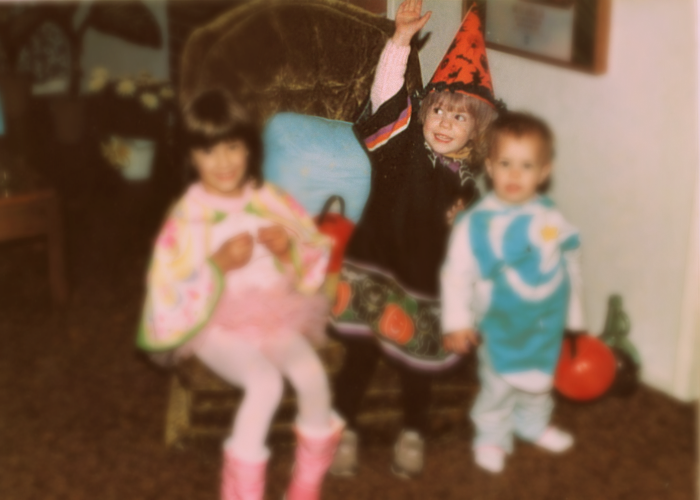 I had this adorable witch costume with an adorable little broom. I remember my biological father decorating my broom with black electrical tape spiraled up the broom handle, and I remember being extremely angry when he took the broom and pretended to use it as a guitar. I remember being so angry in fact, that I refused to carry the broom with me on halloween - I wanted nothing to do with it. Totally irrational toddler feelings - yet feelings that were significant enough to me that I still vividly remember them. Its interesting to think about how our memories are stored in early childhood. How is it that some memories can seem crystal clear - vividly stored and imprinted in our hearts and minds, while others seem to escape us? How are some memories classified and stored manageably while others are pushed into the outer reaches of our psyche to protect us from their harm? How young is really too young to remember? Until the last few years, I experienced large blank spaces in my childhood memories. Not just spotty memories of being three, significant blackouts in memory throughout most of my childhood until becoming a pre-teen. As a teenager I experienced more than the typical emotional upheaval - my heart bled through my adolescent years as I experienced pain and a drowning sadness that seemed to envelope me no matter what was occurring in my life. I struggled through daily life into my early 20's hitting rock bottom several times before recognizing the hand of grace being extended to me. Even after I had witnessed and experienced Christ's saving grace in my life, nothing could have prepared me for what was to come as my 20's came to an end. It was in the security and stability of my marriage at 27 years of age that things started to unravel. I couldn't understand why I began to experience violent emotions and a near hatred for men. The hardest part was feeling that I couldn't seem to emotionally separate my husband from the men who had caused me harm in my life. And it was at this point in time that my eyes began to open. I was desperate to honor and respect this man, my husband, broken in his own ways but not the perpetrator of the crimes I began to subconsciously hold him accountable for. Whether I wanted to face the past or not, I no longer had a choice, as my repressed childhood memories began to surface in unpredictable ways. I have to pause for a minute here and share that one of the most difficult parts of processing what has been going on with me over the past few years has been the inability to trust in my memories. Memory repression is the subject of controversy - with several studies showing outcomes as divided as the current political beliefs of our nation. I had to get to a point of a decision - to proceed open-minded to what was happening to me, willing to allow my memories to form cohesively without judgment - or to just refuse to acknowledge the overwhelming amount of evidence that was beginning to stack up in favor of my fragmented memories. I chose to remain open minded - and began the process of facing honestly the wounds of my past. I wish I could say that what I experienced were flashbacks - like the ones you see in the movies. Vivid, clear - undeniable memory intrusions bursting forward from a certain trigger. But it wasn't like that for me, it hasn't been like that. Instead, I have experienced emotions that seem to come out of nowhere - at an intensity that has terrified me and at times my husband. I have experienced fear and terror, the emptiness of the bottomless pit of depression and despair and unrelenting sadness. The uniqueness of these emotions is their inability to be tied to any present day event, and the inability to process them with my adult reasoning/coping mechanisms. It is hard to explain, but it has been like experiencing these overwhelming emotions as a young child with undeveloped coping skills and zero rationalization. I have also experienced physical memory recovery - I fear more of this is yet to come. When such things are happening to you, it is nearly impossible to accept the audacious idea that there is no grounding in true memory - or that somehow these repressed memories are figments of the imagination as some studies would claim. And yet, the doubts that those claims place on an individual who begins to remember what they have buried, are enough to make you wish even more so that you could bury deeper the reality that desires to surface. I was only three when my anger over such an irrational thing as a broomstick caused a permanent mark in my memory. I was around the same age when the abuse - too terrifying to acknowledge in the moment - was locked away in my memory, the key buried only to surface decades later - when the courage to unlock the past and the desperation to reclaim the future began to demand the attention of the present. Oh Courtney, my heart aches for you and what you're going through. My boyfriend in grad school has a similar experience, and watching him unsurface all of the abuse was so hard. I hope you have someone you can talk to about this, a mentor or counselor or therapist that can guide you through this? Thank you so much Gina - I'm definitely surrounded by supportive friends and family and actively getting help (and have been). I appreciate your understanding so much. Thank you. You're the best, stay strong! Thank you so much Jamie. I so appreciate your positive thoughts. I can relate. There have been so many times where I've found myself having "flashbacks" similar to what you describe.... Not vivid recollections of the past so much as extreme emotional reactions to seemingly commonplace occurrences, and having to piece together where that emotion was actually coming from. It's hard work. Hi Courtney, I am impressed by your strength and courage to share this process with so many that have the same issues. Stay strong girl!! Sending love and positive thoughts your way! Hug hugs to you as you continue to work through all of this. I hope blogging about it gives you some peace and helps. Thank you for sharing part of your story. I experienced a sexual assault in college and it was so, so very hard. I am still dealing with it emotionally but tend to repress my feelings until they suddenly pop up out of the blue. I think that's really the hardest thing about it. It's not surviving the experience but living with the pain for the rest of your life. Thank you so much for taking the time to comment Shauna. It means a lot to me! I miss you friend! Thank you for your understanding, it makes me sad in some ways that any one can relate to my pain, and at the same time, comforted to know that I am not alone. What a brave post, thank you so much for sharing. As always... I am here, Courtney!